David studied violin under Frederick Grinke and viola under Prunella Pacey. While at Durham University, he conducted the University Chamber Orchestra. Since moving to Somerset he’s conducted Somerset Opera, Taunton Sinfonietta and Taunton Youth Orchestra. He is also a regular Musical Director of Taunton Amateur Operatic Society. He has been a soloist with Somerset County Orchestra in Walton’s Viola Concerto and in Mozart’s Sinfonia Concertante for Violin and Viola. David was appointed Artistic Director and Principal Conductor of Somerset County Orchestra in 2005. As a freelance viola player, as well as playing for many local groups, David has worked for HTV, Welsh National Opera, English National Ballet, Travelling Opera and Chrystal Clear Opera. 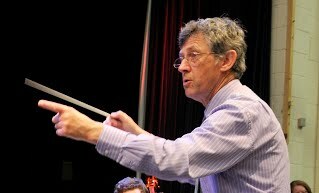 David has recently retired from the post of Head of Strings at Queens College, a position he held since his arrival in Taunton in 1984. Alex studies at Trinity College of Music and graduated in 1995 with distinction. As well as performing extensively on violin and viola as a freelance player throughout the South of England she is also an accomplished teacher and has worked in this capacity in the Caribbean and more recently at Wellington School and privately. Currently she performs with a variety of different groups in the West Country. She is the fiddle player with the popular folk band Hobsons Choice and also forms half of Thalia a classical violin and guitar duo performing regularly in recitals and at private functions.